The revolutions were essentially bourgeois revolutions and democratic and liberal in nature, with the aim of removing the old monarchical structures and creating independent nation-states. The revolutions spread across Europe after an initial revolution began in France in February. Over 50 countries were affected, but with no significant coordination or cooperation among their respective revolutionaries. Some of the major contributing factors were widespread dissatisfaction with political leadership, demands for more participation in government and democracy, demands for freedom of the press, other demands made by the working class, the upsurge of nationalism, and the regrouping of established government forces. The uprisings were led by ad hoc coalitions of reformers, the middle classes and workers, which did not hold together for long. Tens of thousands of people were killed, and many more were forced into exile. Significant lasting reforms included the abolition of serfdom in Austria and Hungary, the end of absolute monarchy in Denmark, and the introduction of representative democracy in the Netherlands. The revolutions were most important in France, the Netherlands, the states of the German Confederation that would make up the German Empire in the late 19th and early 20th century, Italy, and the Austrian Empire. The revolutions arose from such a wide variety of causes that it is difficult to view them as resulting from a coherent movement or set of social phenomena. Numerous changes had been taking place in European society throughout the first half of the 19th century. Both liberal reformers and radical politicians were reshaping national governments. Next, the middle classes began to agitate. [clarification needed] Karl Marx and Friedrich Engels, working in Brussels, had written Manifesto of the Communist Party (published in German in London on February 21, 1848) at the request of the Communist League (an organization consisting principally of German workers). Following the March insurrection in Berlin, they began agitating in Germany. They issued their "Demands of the Communist Party in Germany" from Paris in March; the pamphlet urged unification of Germany, universal suffrage, abolition of feudal duties, and similar middle-class goals. The middle and working classes thus shared a desire for reform, and agreed on many of the specific aims. Their participations in the revolutions, however, differed. While much of the impetus came from the middle classes, much of the cannon fodder came from the lower classes. The revolts first erupted in the cities. The population in French rural areas had risen rapidly, causing many peasants to seek a living in the cities. Many in the bourgeoisie feared and distanced themselves from the working poor. Many unskilled labourers toiled from 12 to 15 hours per day when they had work, living in squalid, disease-ridden slums. Traditional artisans felt the pressure of industrialization, having lost their guilds. Revolutionaries such as Karl Marx built up a following. The liberalisation of trade laws and the growth of factories had increased the gulf among master tradesmen, and journeymen and apprentices, whose numbers increased disproportionately by 93% from 1815 to 1848 in Germany. Significant proletarian unrest had occurred in Lyon in 1831 and 1834, and Prague in 1844. Jonathan Sperber has suggested that in the period after 1825, poorer urban workers (particularly day labourers, factory workers and artisans) saw their purchasing power decline relatively steeply: urban meat consumption in Belgium, France and Germany stagnated or declined after 1830, despite growing populations. The economic crisis of 1847 increased urban unemployment: 10,000 Viennese factory workers were made redundant and 128 Hamburg firms went bankrupt over the course of 1847. With the exception of the Netherlands, there was a strong correlation among the countries that were most deeply affected by the industrial shock of 1847 and those that underwent a revolution in 1848. Urban workers had no choice but to spend half of their income on food, which consisted mostly of bread and potatoes. As a result of harvest failures, food prices soared and the demand for manufactured goods decreased, causing an increase in unemployment. During the revolution, to address the problem of unemployment, workshops were organized for men interested in construction work. Officials also set up workshops for women when they felt they were excluded. Artisans and unemployed workers destroyed industrial machines when they threatened to give employers more power over them. Rural population growth had led to food shortages, land pressure, and migration, both within and from Europe, especially to the Americas. Peasant discontent in the 1840s grew in intensity: peasant occupations of lost communal land increased in many areas: those convicted of wood theft in the Rhenish Palatinate increased from 100,000 in 1829–30 to 185,000 in 1846–47. In the years 1845 and 1846, a potato blight caused a subsistence crisis in Northern Europe, and encouraged the raiding of manorial potato stocks in Silesia in 1847. The effects of the blight were most severely manifested in the Great Irish Famine, but also caused famine-like conditions in the Scottish Highlands and throughout continental Europe. Harvests of rye in the Rhineland were 20% of previous levels, while the Czech potato harvest was reduced by a half. These reduced harvests were accompanied by a steep rise in prices (the cost of wheat more than doubled in France and Habsburg Italy. 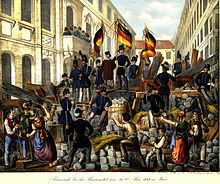 There were 400 French food riots during 1846 to 1847, while German socio-economic protests increased from 28 during 1830 to 39, to 103 during 1840 to 1847. Central to long-term peasant grievances were the loss of communal lands, forest restrictions (such as the French Forest Code of 1827), and remaining feudal structures, notably the robot (labour obligations) that existed among the serfs and oppressed peasantry of the Habsburg lands. Aristocratic wealth (and corresponding power) was synonymous with the ownership of farm lands and effective control over the peasants. Peasant grievances exploded during the revolutionary year of 1848, yet were often disconnected from urban revolutionary movements: the revolutionary Sándor Petőfi's popular nationalist rhetoric in Budapest did not translate into any success with the Magyar peasantry, while the Viennese democrat Hans Kudlich reported that his efforts to galvanise the Austrian peasantry had 'disappeared in the great sea of indifference and phlegm'. Despite forceful and often violent efforts of established and reactionary powers to keep them down, disruptive ideas gained popularity: democracy, liberalism, radicalism, nationalism, and socialism. They demanded a constitution, universal manhood suffrage, press freedom, freedom of expression and other democratic rights, the establishment of civilian militia, liberation of peasants, liberalization of the economy, abolition of tariff barriers and the abolition of monarchical power structures in favor of the establishment of republican states, or at least the restriction of the prince power in the form of constitutional monarchies. In the language of the 1840s, 'democracy' meant replacing an electorate of property-owners with universal male suffrage. 'Liberalism' fundamentally meant consent of the governed and the restriction of church and state power, republican government, freedom of the press and the individual. The 1840s had seen the emergence of a number of radical liberal publications such as the Rheinische Zeitung (1842); Le National and La Réforme (1843) in France; Ignaz Kuranda's Grenzboten (1841) in Austria; Lajos Kossuth's Pesti Hírlap (1841) in Hungary, as well as the increased popularity of the older Morgenbladet in Norway and the Aftonbladet in Sweden. 'Nationalism' believed in uniting people bound by (some mix of) common languages, culture, religion, shared history, and of course immediate geography; there were also irredentist movements. 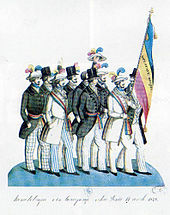 Nationalism had developed a broader appeal during the pre-1848 period, as seen in the František Palacký's 1836 History of the Czech Nation, which emphasised a national lineage of conflict with the Germans, or the popular patriotic Liederkranz (song-circles) that were held across Germany: patriotic and belligerent songs about Schleswig had dominated the Würzburg national song festival in 1845. 'Socialism' in the 1840s was a term without a consensus definition, meaning different things to different people, but was typically used within a context of more power for workers in a system based on worker ownership of the means of production. These concepts together - democracy, liberalism, nationalism and socialism, in the sense described above - came to be encapsulated in the political term radicalism. Every country had a distinctive timing, but the general pattern showed very sharp cycles as reform moved up then down. The world was astonished in spring 1848 when revolutions appeared in so many places and seemed on the verge of success everywhere. Agitators who had been exiled by the old governments rushed home to seize the moment. In France the monarchy was overthrown and replaced by a republic. In a number of major German and Italian states, and in Austria, the old leaders were forced to grant liberal constitutions. The Italian and German states seemed to be rapidly forming unified nations. Austria gave Hungarians and Czechs liberal grants of autonomy and national status. In France bloody street battles exploded between the middle class reformers and the working class radicals. German reformers argued endlessly without finalising their results. Caught off guard at first, the aristocracy and their allies plot a return to power. The revolution went into reverse, with a series of defeats in summer 1849. Reactionaries returned to power and many leaders of the revolution went into exile. Some social reforms proved permanent and years later nationalists in Germany, Italy and Hungary gained their objectives. Although little noticed at the time, the first major outbreak came in Sicily, starting in January 1848. There had been several previous revolts against Bourbon rule; this one produced an independent state that lasted only 16 months before the Bourbons came back. During those months, the constitution was quite advanced for its time in liberal democratic terms, as was the proposal of an Italian confederation of states. The revolt's failure was reversed a dozen years later as the Bourbon kingdom of the Two Sicilies collapsed in 1860–61 with the Risorgimento. The "February Revolution" in France was sparked by the suppression of the campagne des banquets. This revolution was driven by nationalist and republican ideals among the French general public, who believed the people should rule themselves. It ended the constitutional monarchy of Louis-Philippe, and led to the creation of the French Second Republic. This government was headed by Louis-Napoleon, who in 1852 staged a coup d'état and established himself as a dictatorial emperor of the Second French Empire. Denmark had been governed by a system of absolute monarchy since the 17th century. King Christian VIII, a moderate reformer but still an absolutist, died in January 1848 during a period of rising opposition from farmers and liberals. The demands for constitutional monarchy, led by the National Liberals, ended with a popular march to Christiansborg on March 21. The new king, Frederick VII, met the liberals' demands and installed a new Cabinet that included prominent leaders of the National Liberal Party. The national-liberal movement wanted to abolish absolutism, but retain a strongly centralized state. The king accepted a new constitution agreeing to share power with a bicameral parliament called the Rigsdag. It is said that the Danish king's first words after signing away his absolute power were, "that was nice, now I can sleep in the mornings". Although army officers were dissatisfied, they accepted the new arrangement which, in contrast to the rest of Europe, was not overturned by reactionaries. The liberal constitution did not extend to Schleswig, leaving the Schleswig-Holstein Question unanswered. Schleswig, a region containing both Danes (a North Germanic population) and Germans (a West Germanic population), was a part of the Danish monarchy, but remained a duchy separate from the Kingdom of Denmark. Spurred by pan-German sentiment, the Germans of Schleswig took up arms to protest a new policy announced by Denmark's National Liberal government, which would have fully integrated the duchy into Denmark. The German population in Schleswig and Holstein revolted, inspired by the Protestant clergy. 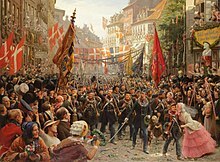 The German states sent in an army, but Danish victories in 1849 led to the Treaty of Berlin (1850) and the London Protocol (1852). They reaffirmed the sovereignty of the King of Denmark, while prohibiting union with Denmark. The violation of the latter provision led to renewed warfare in 1863 and the Prussian victory in 1864. 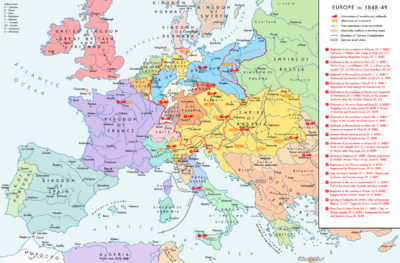 From March 1848 through July 1849, the Habsburg Austrian Empire was threatened by revolutionary movements, which often had a nationalist character. The empire, ruled from Vienna, included Austrians, Hungarians, Slovenes, Poles, Czechs, Croats, Slovaks, Ukrainians/Ruthenians, Romanians, Serbs and Italians, all of whom attempted in the course of the revolution to achieve either autonomy, independence, or even hegemony over other nationalities. The nationalist picture was further complicated by the simultaneous events in the German states, which moved toward greater German national unity. 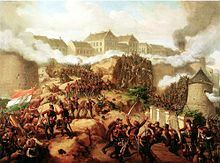 The Hungarian revolution of 1848 was the longest in Europe, crushed in August 1849 by Austrian and Russian armies. Nevertheless, it had a major impact in freeing the serfs. It started on 15 March 1848, when Hungarian patriots organized mass demonstrations in Pest and Buda (today Budapest) which forced the imperial governor to accept their 12 points of demands, which included the demand for freedom of press, an independent Hungarian ministry residing in Buda-Pest and responsible to a popularly elected parliament, the formation of a National Guard, complete civil and religious equality, trial by jury, a national bank, a Hungarian army, the withdrawal of foreign troops from Hungary (Austrian troops), the freeing of political prisoners, and the union with Transylvania. On that morning, the demands were read aloud along with poetry by Sándor Petőfi with the simple lines of "We swear by the God of the Hungarians. We swear, we shall be slaves no more". Lajos Kossuth and some other liberal nobility that made up the Diet appealed to the Habsburg court with demands for representative government and civil liberties. These events resulted in Klemens von Metternich, the Austrian prince and foreign minister, resigning. The demands of the Diet were agreed upon on March 18 by Emperor Ferdinand. Even though Hungary would remain part of the Empire through personal union with the emperor, a constitutional government would be founded. The Diet then passed the April laws that established equality before the law, a legislature, a hereditary constitutional monarchy, and an end to the transfer and restrictions of land use. The revolution grew into a war for independence from the Austrian Empire when Josip Jelačić, Ban of Croatia, crossed the border to restore Habsburg control. The new government, led by Lajos Kossuth, was initially successful against the Habsburg forces. Although Hungary took a national united stand for its freedom, some minorities of the Kingdom of Hungary, including the Serbs of Vojvodina, the Romanians of Transylvania and some Slovaks of Upper Hungary supported the Habsburg Emperor and fought against the Hungarian Revolutionary Army. Eventually, after one and a half years of fighting, the revolution was crushed when Russian Tsar Nicholas I marched into Hungary with over 300,000 troops. Hungary was thus placed under brutal martial law, with the Austrian government restored. The leading rebels like Kossuth fled into exile or were executed. In the long run, the passive resistance following the revolution led to the Austro-Hungarian Compromise (1867), which marked the birth of the Austro-Hungarian Empire. The center of the Ukrainian national movement was in Galicia, which is today divided between Ukraine and Poland. On April 19, 1848, a group of representatives led by the Greek Catholic clergy launched a petition to the Austrian Emperor. It expressed wishes that in those regions of Galicia where the Ruthenian (Ukrainian) population represented majority, the Ukrainian language should be taught at schools and used to announce official decrees for the peasantry; local officials were expected to understand it and the Ruthenian clergy was to be equalized in their rights with the clergy of all other denominations. On May 2, 1848, the Supreme Ruthenian (Ukrainian) Council was established. The Council (1848–1851) was headed by the Greek-Catholic Bishop Gregory Yakhimovich and consisted of 30 permanent members. Its main goal was the administrative division of Galicia into Western (Polish) and Eastern (Ruthenian/Ukrainian) parts within the borders of the Habsburg Empire, and formation of a separate region with a political self-governance. During 18–19 March, a series of riots known as the March Unrest (Marsoroligheterna) took place in the Swedish capital of Stockholm. Declarations with demands of political reform were spread in the city and a crowd were dispersed by the military, leading to 18 casualties. Switzerland, already an alliance of republics, also saw an internal struggle. The attempted secession of seven Catholic cantons to form an alliance known as the Sonderbund ("separate alliance") in 1845 led to a short civil conflict in November 1847 in which around 100 people were killed. The Sonderbund was decisively defeated by the Protestant cantons, which had a larger population. A new constitution of 1848 ended the almost-complete independence of the cantons, transforming Switzerland into a federal state. Polish people mounted a military insurrection against the Prussians in the Grand Duchy of Posen (or the Greater Poland region), a part of Prussia since its annexation in 1815. The Poles tried to establish a Polish political entity, but refused to cooperate with the Germans and the Jews. The Germans decided they were better off with the status quo, so they assisted the Prussian governments in recapturing control. In the long-term, the uprising stimulated nationalism among both the Poles and the Germans and brought civil equality to the Jews. A Romanian liberal and Romantic nationalist uprising began in June in the principality of Wallachia. The goals of the rebels were the union of all Romanians, the abolition of serfdom, and popular self-determination. It was closely connected with the 1848 unsuccessful revolt in Moldavia, it sought to overturn the administration imposed by Imperial Russian authorities under the Regulamentul Organic regime, and, through many of its leaders, demanded the abolition of boyar privilege. Led by a group of young intellectuals and officers in the Wallachian military forces, the movement succeeded in toppling the ruling Prince Gheorghe Bibescu, whom it replaced with a provisional government and a regency, and in passing a series of major liberal reforms, first announced in the Proclamation of Islaz. Despite its rapid gains and popular backing, the new administration was marked by conflicts between the radical wing and more conservative forces, especially over the issue of land reform. Two successive abortive coups weakened the new government, and its international status was always contested by Russia. After managing to rally a degree of sympathy from Ottoman political leaders, the Revolution was ultimately isolated by the intervention of Russian diplomats. In September 1848 by agreement with the Ottomans, Russia invaded and put down the revolution. According to Vasile Maciu, the failures were attributable in Wallachia to foreign intervention, in Moldavia to the opposition of the feudalists, and in Transylvania to the failure of the campaigns of General Józef Bem, and later to Austrian repression. In later decades the rebels returned and gained their goals. Belgium did not see major unrest in 1848; it had already undergone a liberal reform after the Revolution of 1830, and thus its constitutional system and its monarchy survived. A number of small local riots broke out, concentrated in the sillon industriel industrial region of the provinces of Liège and Hainaut. The most serious threat of revolutionary contagion, however, was posed by Belgian émigré groups from France. In 1830 the Belgian Revolution had broken out inspired by the revolution occurring in France, and Belgian authorities feared that a similar 'copycat' phenomenon might occur in 1848. Shortly after the revolution in France, Belgian migrant workers living in Paris were encouraged to return to Belgium to overthrow the monarchy and establish a republic. Belgian authorities expelled Karl Marx himself from Brussels in early March on accusations of having used part of his inheritance to arm Belgian revolutionaries. Around 6,000 armed émigrés of the "Belgian Legion" attempted to cross the Belgian frontier. There were two divisions which were formed. The first group, travelling by train, were stopped and quickly disarmed at Quiévrain on 26 March 1848. The second group crossed the border on 29 March and headed for Brussels. They were confronted by Belgian troops at the hamlet of Risquons-Tout and defeated. Several smaller groups managed to infiltrate Belgium, but the reinforced Belgian border troops were successful and the defeat at Risquons-Tout effectively ended the revolutionary threat to Belgium. The situation in Belgium began to recover that summer after a good harvest, and fresh elections returned a strong majority to the governing party. A tendency common in the revolutionary movements of 1848 was a perception that the liberal monarchies set up in the 1830s, despite formally being representative parliamentary democracies, were too oligarchical and/or corrupt to respond to the urgent needs of the people, and were therefore in need of drastic democratic overhaul or, failing that, separatism to build a democratic state from scratch. This was the process that occurred in Ireland between 1801 and 1848. Previously a separate kingdom, Ireland was incorporated into the United Kingdom in 1801. Although its population was made up largely of Catholics, and sociologically of agricultural workers, tensions ensued from the political overrepresentation of agrarian landowners of Protestant background loyal to the United Kingdom. From the 1810s a conservative-liberal movement led by Daniel O'Connell had sought to secure equal political rights for Catholics within the British political system, successful in the Roman Catholic Relief Act 1829. But as in other European states, a current inspired by Radicalism criticised the conservative-liberals for pursuing democratic equality with excessive compromise and gradualism. In Ireland a current of nationalist, egalitarian and Radical republicanism inspired by the French Revolution, had been present since the 1790s. This tendency grew into a movement for social, cultural and political reform during the 1830s, and in 1839 was concretised into a political association known as Young Ireland. The ideas of Young Ireland were initially not well received, but grew more popular after the Great Famine of 1847, an event that brought catastrophic social effects and which threw into light the inadequate response of authorities. The spark for the Young Irelander Revolution came in 1848 when the British Parliament passed the "Crime and Outrage Bill". The Bill was essentially a declaration of martial law in Ireland, designed with the deliberate purpose of creating a counter-insurgency against the growing Irish nationalist movement. 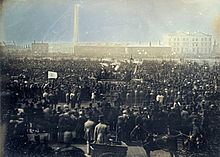 In response, the Young Ireland Party launched its rebellion in July 1848, gathering landlords and tenants to its cause. It is sometimes called the Famine Rebellion (since it took place during the Great Famine in Ireland) or the Battle of Ballingarry. While no revolution occurred in Spain in the year 1848, a similar phenomenon occurred. The European revolutions erupted at a moment when the political regime in Spain was facing great criticism from within one of its two main parties, and by 1854 a radical-liberal revolution and a conservative-liberal counter-revolution had both occurred. Since 1833, Spain had been governed by a conservative-liberal parliamentary monarchy similar to and modelled on the July Monarchy in France. In order to exclude absolute monarchists from government, power had alternated between two liberal parties: the centre-left Progressive Party, and the centre-right Moderate Party. But a decade of rule by the centre-right Moderates had recently produced a constitutional reform (1845), prompting fears that the Moderates sought to reach out to Absolutists and permanently exclude the Progressives. The left-wing of the Progressive Party, which had historical links to Jacobinism and Radicalism, began to push for root-and-branch reforms to the constitutional monarchy, notably universal male suffrage and parliamentary sovereignty. 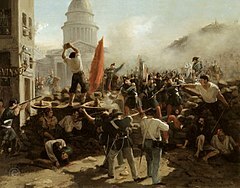 The European Revolutions of 1848 and particularly the French Second Republic prompted the Spanish radical movement to adopt positions incompatible with the existing constitutional regime, notably republicanism. This ultimately led the Radicals to exit the Progressive Party to form the Democratic Party in 1849. Over the next years two revolutions occurred. In 1852 the conservatives of the Moderate Party were ousted after a decade in power by an alliance of Radicals, Liberals and liberal Conservatives led by Generals Espartero and O'Donnell. In 1854, the more conservative half of this alliance launched a second revolution to oust the republican Radicals, leading to a new ten-year period of government by lconservative-liberal monarchists. Taken together the two revolutions can be thought of as echoing aspects of the French Second Republic: the Spanish Revolution of 1852, as a revolt by Radicals and Liberals against the oligarchical, conservative-liberal parliamentary monarchy of the 1830s, mirrored the French Revolution of 1848; while the Spanish Revolution of 1854, as a counter-revolution of conservative-liberals under a military strongman, had echoes of Louis-Napoléon Bonaparte's coup against the French Second Republic. The Island of Great Britain, Belgium, the Netherlands, Portugal, the Russian Empire (including Poland and Finland), and the Ottoman Empire did not encounter major national or Radical revolutions over this period. Sweden and Norway were also little affected. Serbia, though formally unaffected by the revolt as it was a part of the Ottoman state, actively supported Serbian revolutionaries in the Habsburg Empire. Russia's relative stability was attributed to the revolutionary groups' inability to communicate with each other. In some countries, uprisings had already occurred demanding similar reforms to the Revolutions of 1848, but without much success. This was case for the Kingdom of Poland and the Grand Duchy of Lithuania, which had seen a series of uprisings before or after but not during 1848: the November Uprising of 1830–31; the Kraków Uprising of 1846 (notable for being quelled by the anti-revolutionary Galician slaughter), and later on the January Uprising of 1863–65. In yet other countries the absence of unrest was partly due to governments taking action to prevent revolutionary unrest, and pre-emptively grant some of the reforms demanded by revolutionaries elsewhere. This was notably the case for the Netherlands, where King William II decided to alter the Dutch constitution to reform elections and voluntarily reduce the power of the monarchy. The same might be said of Switzerland, where a new constitutional regime was introduced in 1848: the Swiss Federal Constitution was a revolution of sorts, laying the foundation of Swiss society as it is today. While no major political upheavals occurred in the Ottoman Empire as such, political unrest did occur in some of its vassal states. In Serbia, feudalism was abolished and the power of the Serbian prince was reduced with the Turkish Constitution of Serbia in 1838. In Britain, while the middle classes had been pacified by their inclusion in the extension of the franchise in the Reform Act 1832, the consequential agitations, violence, and petitions of the Chartist movement came to a head with their peaceful petition to Parliament of 1848. The repeal in 1846 of the protectionist agricultural tariffs – called the "Corn Laws" – had defused some proletarian fervour. In the Isle of Man, there were ongoing efforts to reform the self-elected House of Keys, but no revolution took place. Some of the reformers were encouraged by events in France in particular. In the United States, opinions were polarized, with Democrats and reformers in favor, although they were distressed at the degree of violence involved. Opposition came from conservative elements, especially Whigs, southern slaveholders, orthodox Calvinists, and Catholics. About 4000 German exiles arrived and some became fervent Republicans in the 1850s, such as Carl Schurz. Kossuth toured America and won great applause, but no volunteers or diplomatic or financial help. In Spanish Latin America, the Revolution of 1848 appeared in New Granada, where Colombian students, liberals, and intellectuals demanded the election of General José Hilario López. He took power in 1849 and launched major reforms, abolishing slavery and the death penalty, and providing freedom of the press and of religion. The resulting turmoil in Colombia lasted four decades; from 1851 to 1885, the country was ravaged by four general civil wars and 50 local revolutions. In Brazil, the "Praieira Revolt," a movement in Pernambuco, lasted from November 1848 to 1852. Unresolved conflicts left over from the period of the regency and local resistance to the consolidation of the Brazilian Empire that had been proclaimed in 1822 helped to plant the seeds of the revolution. We have been beaten and humiliated ... scattered, imprisoned, disarmed and gagged. The fate of European democracy has slipped from our hands. Most of what the men of 1848 fought for was brought about within a quarter of a century, and the men who accomplished it were most of them specific enemies of the 1848 movement. Thiers ushered in a third French Republic, Bismarck united Germany, and Cavour, Italy. Deák won autonomy for Hungary within a dual monarchy; a Russian czar freed the serfs; and the British manufacturing classes moved toward the freedoms of the People's Charter. Democrats looked to 1848 as a democratic revolution, which in the long run ensured liberty, equality, and fraternity. For nationalists, 1848 was the springtime of hope, when newly emerging nationalities rejected the old multinational empires. But the end results were not as comprehensive as many had hoped. Many governments engaged in a partial reversal of the revolutionary reforms of 1848–1849, as well as heightened repression and censorship. The Hanoverian nobility successfully appealed to the Confederal Diet in 1851 over the loss of their noble privileges, while the Prussian Junkers recovered their manorial police powers from 1852 to 1855. In the Austrian Empire, the Sylvester Patents (1851) discarded Franz Stadion's constitution and the Statute of Basic Rights, while the number of arrests in Habsburg territories increased from 70,000 in 1850 to one million by 1854. 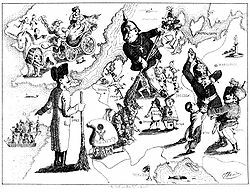 Nicholas I's rule in Russia after 1848 was particularly repressive, marked by an expansion of the secret police (the Tretiye Otdeleniye) and stricter censorship; there were more Russians working for censorship organs than actual books published in the period immediately after 1848. In France, the works of Ledru-Rollin, Hugo, Baudelaire and Proudhon were confiscated. In the post-revolutionary decade after 1848, little had visibly changed, and many historians considered the revolutions a failure, given the seeming lack of permanent structural changes. More recently, Christopher Clark has characterised the period that followed 1848 as one dominated by a 'revolution in government'. Karl Marx expressed disappointment at the bourgeois character of the revolutions. The Prussian Prime Minister Otto von Manteuffel declared that the state could no longer be run 'like the landed estate of a nobleman'. In Prussia, August von Bethmann-Hollweg's Preußisches Wochenblatt newspaper (founded 1851) acted as a popular outlet for modernising Prussian conservative statesmen and journalists against the reactionary Kreuzzeitung faction. 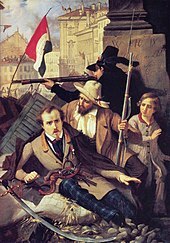 The revolutions of 1848 were followed by new centrist coalitions dominated by liberals nervous of the threat of working-class socialism, as seen in the Piedmontese Connubio under Cavour. Governments after 1848 were forced into managing the public sphere and popular sphere with more effectiveness, resulting in the increased prominence of the Prussian Zentralstelle für Pressangelegenheiten (Central Press Agency, established 1850), the Austrian Zensur-und polizeihofstelle, and the French Direction Générale de la Librairie (1856). Reinhard Rürup has described the 1848 Revolutions as a turning point in the development of modern antisemitism through the development of conspiracies that presented Jews as representative both of the forces of social revolution (apparently typified in Joseph Goldmark and Adolf Fischhof of Vienna) and of international capital, as seen in the 1848 report from Eduard von Müller-Tellering, the Viennese correspondent of Marx's Neue Rheinische Zeitung, which declared: "tyranny comes from money and the money belongs to the Jews". About 4000 exiles came to the United States fleeing the reactionary purges. Of these 100 went to the Texas Hill Country as German Texans. More widely, many disillusioned and persecuted revolutionaries, in particular (though not exclusively) those from Germany and the Austrian Empire, left their homelands for foreign exile in the New World or in the more liberal European nations: these emigrants were known as the Forty-Eighters. Steven Brust and Emma Bull's 1997 epistolary novel Freedom & Necessity is set in England in the aftermath of the Revolutions of 1848. Mike Duncan's Revolutions Podcast series covered the Revolutions of 1848 starting with episode 7.01. ^ Mike Rapport (2009). 1848: Year of Revolution. Basic Books. p. 201. ISBN 978-0-465-01436-1. The first deaths came at noon on 23 June. ^ Robert Bideleux and Ian Jeffries, A History of Eastern Europe: Crisis and Change, Routledge, 1998. ISBN 0415161118. pp. 295–96. ^ Berg, Maxine (1982-02-04). The Machinery Question and the Making of Political Economy 1815–1848. ISBN 9780521287593. ^ Sperber, Jonathan. The European Revolutions of 1848 (1994), pp. 152, 232. ^ John Merriman, A History of Modern Europe (3rd ed. 2010) ch 16 pp 613–48 online. ^ Melvin Kranzberg, 1848: A Turning Point? (1962) p xi, xvii–xviii. ^ a b Kranzberg, 1848: A Turning Point? (1962) p xii, xvii–xviii. ^ Kranzberg, 1848: A Turning Point? (1962) p xii, . ^ William Roberts, Encyclopedia of Modern Dictators (2006) pp 209–211. ^ a b Weibull, Jörgen. "Scandinavia, History of." Encyclopædia Britannica 15th ed., Vol. 16, 324. ^ Deak, Istvan. The Lawful Revolution. New York: Columbia University Press, 1979. ^ a b "The US and the 1848 Hungarian Revolution." The Hungarian Initiatives Foundation. Accessed March 26, 2015. http://www.hungaryfoundation.org/history/20140707_US_HUN_1848. ^ Kost' Levytskyi, The History of the Political Thought of the Galician Ukrainians, 1848–1914, (Lviv, 1926), 17. ^ Kost' Levytskyi, The History of the Political Thought of the Galician Ukrainians, 1848–1914, (Lviv, 1926), 26. ^ Krzysztof Makowski, "Poles, Germans and Jews in the Grand Duchy of Poznan in 1848: From coexistence to conflict." East European Quarterly 33.3 (1999): 385. ^ Vasile Maciu, "Le caractère unitaire de la révolution de 1848 dans les pays roumains." Revue Roumaine d'Histoire 7 (1968): 679–707. ^ Stefan Huygebaert, "Unshakeable Foundations," Journal of Belgian History 45.4 (2015). ^ a b Chastain, James. "Belgium in 1848". Encyclopedia of 1848 Revolutions. Ohio University. Archived from the original on 2011-08-11. ^ Ascherson, Neal (1999). The King Incorporated: Leopold the Second and the Congo (New ed.). London: Granta. pp. 20–21. ISBN 978-1862072909. ^ "Serbia's Role in the Conflict in Vojvodina, 1848–49". Ohiou.edu. 2004-10-25. Archived from the original on 2008-09-25. Retrieved 2013-10-01. ^ Fyson, Robert (2016). The Struggle for Manx Democracy. Douglas: Culture Vannin. ISBN 9780993157837. ^ Gazmuri, Cristián (1999). 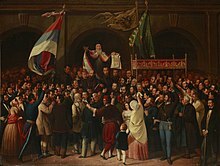 El "1849" chileno: Igualitarios, reformistas, radicales, masones y bomberos (PDF) (in Spanish). Santiago, Chile: Editorial Universitaria. p. 104. Retrieved June 1, 2014. ^ Priscilla Smith Robertson quoted in John Feffer (1992). Shock Waves: Eastern Europe After the Revolutions. p. 291. ^ Price, Roger. The French Second Empire: An Anatomy of Political Power (Cambridge, 2001), p. 327. ^ "England and Revolution by Marx 1848". Marxists Internet Archive. Retrieved November 16, 2018. ^ Brust, Steven; Bull, Emma (1997). Freedom and Necessity. New York: Tor Books. ISBN 9780812562613. Retrieved August 2, 2017.